It is the dark time of the year. Each day grows shorter as we approach the winter solstice. So often we use light as a positive symbol. Our flaming chalice is only one example. Light is a good thing, but we need the dark too. We need the night as a time to rest and to sleep, and we need the winter as a time to rest and recover before we begin yet another year. This week we have changed to the winter colors here in the sanctuary. We change them four times a year as a reminder that our lives are of the earth and the changing seasons affect us in ways that are not always obvious. This week is the winter solstice. The celebration of the winter solstice is an earth-centered tradition, a very ancient one. Christmas celebrations have always incorporated some of the solstice rituals, of food, of holly, and of fire. We are so connected to this earth. Our planet spins through space and tilts on its axis giving us seasons and changes in light and warmth. Life is not all about the future. We carry our past within our hearts and minds. We carry our experiences in our bodies too. Many of the lessons we have learned from living are much too valuable to cast aside. We have to learn to add and subtract before we can learn multiplication and long division, much less calculus. There are lessons from the earth as well, if we let ourselves feel them. The earth in winter takes in all the brown leaves and the plants that have died in the fall, buries them beneath the snow, and changes them, making a rich loam from which new life might grow in the springtime. I invite you to ponder for a few minutes about what you have been holding within you that no longer serves you well. For the adults and youth, try to think of things that happened a year or more ago that still plague you, things that you turn over again and again in your mind. Events you relive, perhaps in pain, perhaps in regret, perhaps in anger. You also might want to consider some of the hopes or desires that you may be still holding on to, even though you know they will never happen, things that might prevent you from appreciating what you have. Don’t worry now, if you can, about the fresher stuff. Sometimes, most times, we need to process serious events for at least a year, to let them simply swirl within us just as our planet turns and circles all the way around the sun. Some things also can take longer just because they are very hard. Violence and betrayal are two things that can take years to heal, and if you have experienced that, you might not be ready yet to let them go. That is OK. But try now, if you can, to set all of those newer and all those still very difficult things aside for now, just for the rest of the hour. Mary, with some help from some young volunteers, will now begin passing around a basket of pieces of tissue paper. I’d like each of you to take a piece of that tissue paper. This ritual is sometimes done with fire, but today we are going to use water as we have done here in the past. We will have some time for you to settle on one thing that you would like to leave behind you, something that needs to be transformed or simply composted, thrown into the trash. Then, when you are ready, write a word or two or draw a picture that represents what you want to leave behind. It only needs to make sense to you. No one else will read them. We have done this before, and each time afterward, although the writings and drawings disappeared, the paper remained. It was transformed. 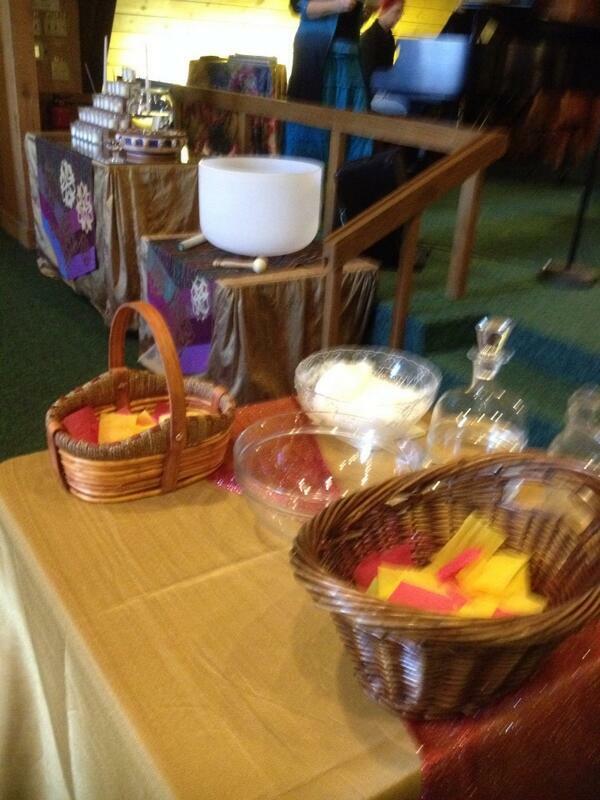 I will lay this tissue paper heart near the bowl so you can see what can come from a ritual such as this. After the musical reflection I will ask you to come forward as you are ready. Just drop your piece of paper into this bowl. Nic will play some music while we do that. It isn’t necessary, but if you want to whisper a word or two naming what you are leaving behind, either to me or directly into the bowl, that is also fine. Does everyone have a piece of paper? There should be pencils in each pew. Share if you need to. Please come forward when you are ready. Try not to form a long line – just 3 or 4 people waiting at a time would be great. We bless this bowl containing so many troubles, so many heartaches. Feeling them, living through them, has made us who we are and we are grateful. There is beauty in this bowl. There is beauty in all of us. We also add some snow, putting whatever pain and fear contained here safely to rest. This cold blanket as it melts will drain these things of their power to harm us in the coming days and years. Spirits of the darkness, the air, the fire, the water, and the earth, we thank you for being with us. We now turn toward the sun, a little lighter, ready for the new day, new life, as we are born and reborn again. May our lights and our lives shine a bit brighter from this day forward. Blessed Be.